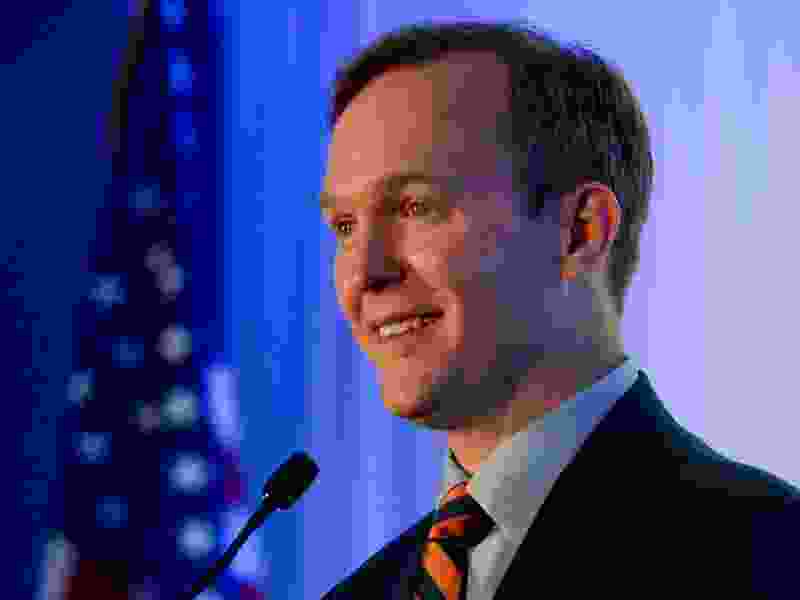 Leah Hogsten | The Salt Lake Tribune Utah's 4th Congressional District Democratic challenger, Salt Lake County Mayor Ben McAdams, at the Utah Democratic election night headquarters at the Radisson Hotel Salt Lake City, Tuesday, Nov. 6, 2018. The 4th Congressional District race between Salt Lake County Mayor Ben McAdams and Rep. Mia Love is still too close to call as thousands of ballots remain uncounted. If elected, McAdams would take office in January, with two years left in his second term as county mayor — leaving an opening for new leadership the Salt Lake County Democratic Party said it would be prepared to fill. If McAdams vacates the seat, Dang said state law outlines a process for replacing him that starts with the County Council notifying party leadership, which would then have 30 days to appoint a replacement. Interested candidates would be able to put their names forward for consideration, and a vote of approximately 1,100 central committee members would decide a replacement. No Salt Lake County mayor has resigned in recent years, but the process for replacing county officials has become relatively commonplace. In June, county Democrats chose Ann Granato to fill the vacancy on the County Council left by the death of her husband, Sam Granato. And, in August 2017, the party elevated Rosie Rivera to lead the Unified Police Department as county sheriff after Jim Winder vacated his term early to become Moab’s police chief. Ann Granato and Rivera were both elected to their first full terms on Tuesday. Around the same time the Democrats were working to appoint a new sheriff, the Salt Lake County Republican Party picked former state Rep. Adam Gardiner as county recorder. Gardiner, who replaced the late Gary Ott after months of turmoil in the office, trails Democratic challenger Rashelle Hobbs after Tuesday’s election, but he has yet to concede the race. In the case of McAdams’ seat, the county could be out a mayor for up to 30 days. But County Council Chairwoman Aimee Winder Newton said a vacancy likely wouldn’t pose too big of a challenge for the council and its work. Potential contenders for McAdams’ seat likely will keep quiet to see what happens after the rest of the 4th District votes are counted. But already, two-term County Councilwoman Jenny Wilson, who ran unsuccessfully in this election cycle for U.S. Senate against Republican Mitt Romney, has been floated as a potential mayoral contender. Wilson, reached for comment Wednesday, would not say for sure whether she’d throw her name into the race if it came to that, but she hinted that she would consider it. Correction: A previous version of this article misstated who would vote on a new county mayor. It is the central committee members.